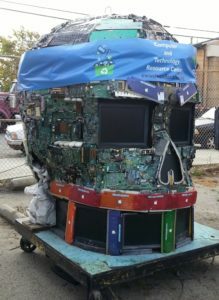 We are a non‑profit, environmental charity committed to household electronics and computer recycling. We give away refurbished computers to those in need. Since 1994, we have given away thousands of computers to schools, non‑profit organizations and economically and/or physically disadvantaged individuals. Our electronics and computer recycling efforts support our training program, where volunteers learn to reclaim, refurbish, and restore computers for home, school, and office applications. We are a 501(c)(3) non-profit charity – US tax ID# 68-0395504 – and a certified e-waste collector – CEW ID# 100285 – CA Dept of Toxic Substance Control # 4198.